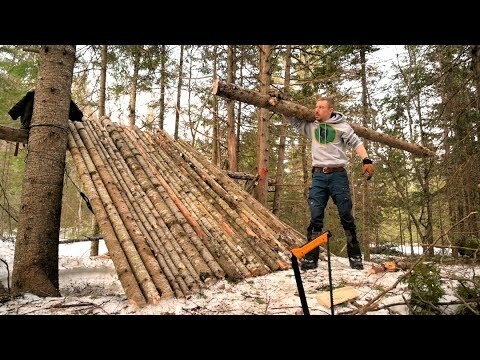 Join myself, Doug Linker https://www.youtube.com/channel/UC-eOXKXJ2GQ1gewivwNxYKQ and Bushtrekboosh https://www.youtube.com/channel/UCPCy5p3hCtMO0vYuLoBXo-Q on an awesome overnight bushcraft camp, we build natural beds out of spruce boughs, dig down into the snow to make sleeping quarters at the fort. We roast a rabbit on a spit, make garlic bread, steak and beans as well. We use a long fire and wool blankets for warmth.